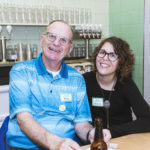 Established in 1989, Store to Door is the Multnomah County Aging and Disability Services preferred grocery assistance provider. In 2014, we received a Governor’s Award for our outstanding volunteer program. We take orders over the phone and deliver groceries, prescription medications, and household items to seniors and people with disabilities. Each year, more than 17,000 volunteer hours help us fill and deliver over 9,000 orders.